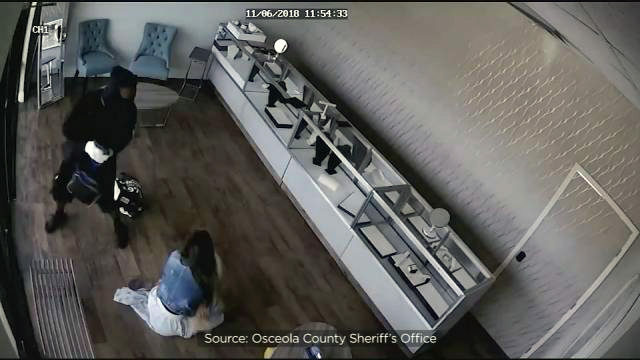 A masked and gloved gunman stormed into a jewelry story Tuesday morning in an attempt to rob it but left empty-handed after being spooked, the Osceola County Sheriff's Office said. The man, who remains at large, barged into Aldo Jewelry near Simpson and Fortune roads, as the couple who owns the store was opening it, deputies said. 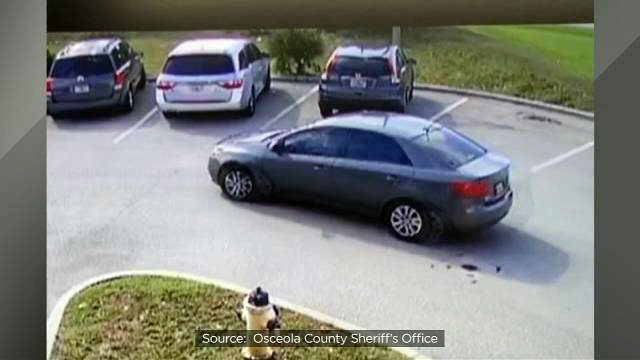 Investigators said the woman tried to keep the door closed, but the man overpowered, knocking the woman into a table and kicking�a 10-year-old dog, causing it to cry, deputies said. Investigators said the man�demanded cash and jewelry. They said the woman was hospitalized through Wednesday and must now wear�a neck brace, because she is sore and has trouble turning her head. There was no jewelry or cash in the store because the store's inventory had not been set up yet, deputies said. Investigators said the man, whom the victims' described as agitated and possibly drugged, got into�a gray Kia Forte, which was driven away.